If an island in a sub-tropical region were to be unreachable because of natural phenomena, what could those phenomena be? The people trying to reach said island have 17th century seafaring technologies. An island that is entirely surrounded by an undersea methane gas fissure that is constantly active would be inaccessible by any kind of ship even with modern seafaring technology. The only way to reach such an island would be by air (which your world doesn't have). Methane gas has the very real-world property that it reduces the buoyancy of a water causing any boat passing over a gas fissure to capsize and sink. Such fissures do exist naturally on the Earth. In fact, methane fissures are one of the more plausible explanations for the Bermuda Triangle (even though the Bermuda Triangle is myth; ships are no more likely to sink there than anywhere else). If you're looking for a weather-related phenomenon, think of a permanent hurricane that encircles the island at all times. Jupiter's Red Spot is an example of a hurricane that has been spinning for eons. It's not hard to imagine something like that existing on a habitable planet. If the island were in the eye of such a hurricane, the winds there would be calm and the environment peaceful. None of the inhabitants there (if there are any) would know of the world beyond the great storm, and no outside vessel would survive the trip through it. They are and were a very dangerous obstruction for ships if they only leave very shallow water for passage. Because the ground climbs very steep, it causes massive breakers, destroying any ship stranded on the reef and making a passage per boat very dangerous. In fact, there is a reason why most of the exploring of uncharted lands occurs during the 18th century. Only precise navigation allow the creation of maps which give location of reefs for further exploring and that was not possible until the longitude problem was solved.. James Cook had access to the newly available lunar distance method and later copies of John Harrisons H4 chronometer. Put the island in the subtropic southern pacific. There both trade winds and the South Equatorial current are running in the same direction. Fully-rigged sailships like in the 17th century can run close-hauled (zig-zagging in direction of the wind), but not very good. So if the island is a far away from ports in the west (logistics), it is nearly impossible to reach from the western side. On the eastern side build reefs/shallows which are formed like a elongated horseshoe. Large reefs like that reveal themselves through the continous braking of waves so the sailors will be alarmed in time, but the ship is trapped in lee shore position: Both wind and current are moving it against the reef which is a death trap. Only agile ships like schooners will be able to escape the trap. 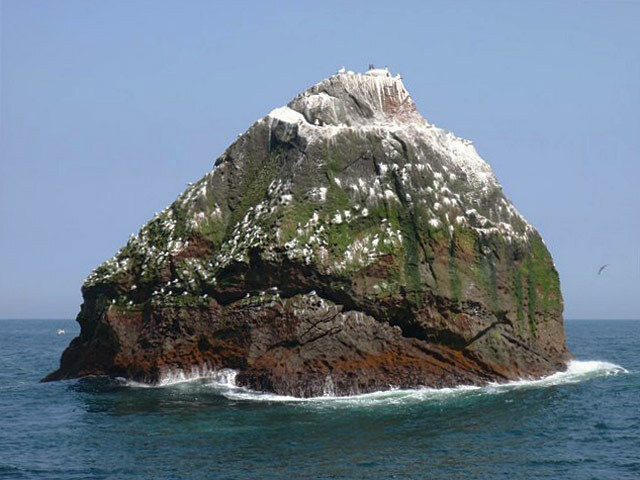 Rockall is a barren island that is approximately equidistant between Ireland, Scotland, and Iceland, temperate, but with no natural harbor or even an obvious place that one can land without ramming into a cliff face. Wikipedia, citing Fisher, James (1957). Rockall. The Country Book Club. pp. 23–35., states that the first known visit to Rockall was in 1810. You have an island that has cliff faces except in one area. You can pass through a narrow, turning area and reach a calm body of water within. Volcanic gases are bubbling up in the lake. Normally it is in a delicate balance with the CO2 saturated water staying trapped in the depths. It doesn't take much to upset the balance, though--say, a ship's anchor dropping into it. Doldrums, Trade Winds, Gyres, and optionally: Perpetual Overcast and Military Mandates. Start off by having your island located in the doldrums; anywhere between 5°N and 5°S. Next, make the topography of your island so that whenever the trade winds do kick up, all the air at the surface flows away from the island. I'm no meteorologist but I think if you made Death Valley (which is below sea level) into an island (and perhaps surrounded it by mountains), that would condense the moisture out of the passing air and continually feed these winds. Or all of the above, vice versa. See also, ocean gyre. 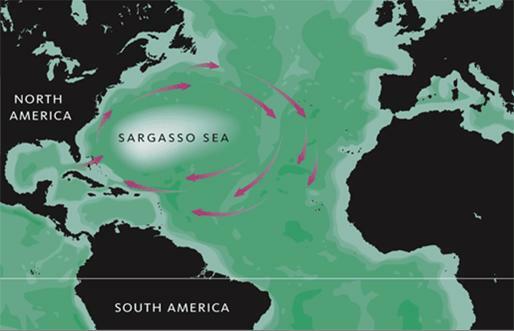 For instance, the Sargasso Sea, which is the home of the Bermuda Triangle and the real reason why the area is so treacherous to sailing vessels. If you really want to screw with the navigator, make your planet perpetually cloud covered. That will make using sextants difficult and navigating by the stars impossible. Couple all of that with a mandate that under no circumstances should any naval vessel sail into these waters, and until someone eccentric enough and with deep enough pockets charters a 'scientific' expedition, your mystery island will remain completely undiscovered. Yar. There be dragons. The only thing that keeps people away now is radioactivity. In the 17th century this was not something they knew about. But they would simply get sick and die terribly if they tried to stay there for any length of time, especially if they collected the strange glowing rocks. So why would short-lived (geologically speaking) isotopes be around? For a first idea, consider the natural fission reactor. How about a meteorite? A chunk from a newer patch of dust, only recently enriched by a supernova, sent planitismals scattering. Or, you might start with natural uranium or thorium ore, but provide a unique way to concentrate daughter elements to dangerous levels. People are experimenting with using microbes to mine, and metal deposits have been caused by such microbes. So maybe something evolves that uses uranium and thus concentrates it. This also causes high mutation rates, so you see other microbes and eventually complex life that makes use of all the available daugher elements. This has the further benefit of making all the life on the island “mosterous”, decended from extremophiles that live deep in the Earth and hot springs. And of course it’s all highly toxic and radioactive: even the pollen will be inhaled and cause bleeding tumors. Any crew that comes up to the island for a few hours, even if they don't send a shore party to get fresh water and food (as is SOP) will be too infirm to work the ship within 2 months and dead in 6. Normally any ship will take on water, meat, and fruits and vegetables — this will kill them within days. It could be closed off on all sides such as this example from Pokemon. This is a giant volcanic crater, the only way to get in there (in this case) is by diving underwater. While diving is certainly something that most anyone could do, finding an entrance wouldn't necessarily be easy (the first people to discover it would have likely done so by luck). 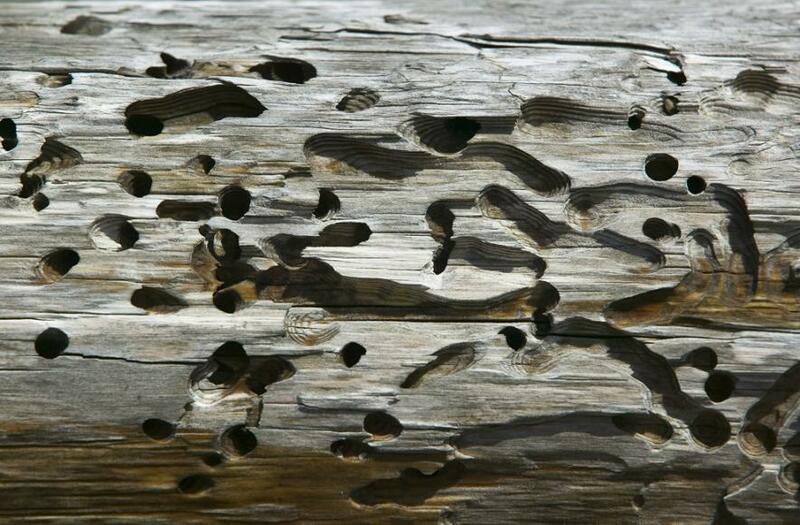 Make the shipworms very large and very hungry, and no ship will come anywhere close to the island and tell the story until a century later when they figure out copper sheathing. Perhaps a volcanic eruption or a extra terrestrial impact created a crater with several concentric ring walls. The outermost ring wall looks like a very large island with steep cliffs rising out of the sea all around. Trying to land on the cliff side is very dangerous. If someone manages to land and climb up to the top of the cliffs they will see the top of the ring wall is rather thin and bare and treeless. On the inner side are more cliffs falling down to into the sea, connected by underwater passages, or maybe a freshwater lake formed by rainwater. And maybe from the top they can see all the way to the next inner ring wall, or maybe it is beyond the horizon. So there is no gap in the outer ring wall, no way to sail a ship through it, no trees to build a boat or a raft, and it would be be very hard to haul a boat up and then lower it into the inner body of water to explore it. Thus the outer ring wall will be mapped. But nobody knows how many inner ring walls there are and if there is a large island in the center. Does that make it isolated enough for 17th century technology? Possibly someone made up a myth that there is a central island that is a paradise or loaded with gold or something, and thus the protagonists foolishly believe the myth and seek to reach the central island without any proof there actually is one or what it may be like. An island with no natural harbors, with steep cliffs all around (such as Rockall in a previous answer), in choppy waters and with at least seasonal bad weather, should do the trick, at least statistically. There's no place that can be one-hundred-percent-guaranteed unreachable but there are many places that most people don't consider it worthwhile enough going to great trouble trying to reach in the first place. If your island has no safe place to land a boat, and the weather around it is usually bad, and the island is away from the main seagoing routes (so that getting there takes a lot of time), and there's nothing there of great value (that you know), then only very determined people will even thinking of trying. That in itself will also contribute to the island's legend of inaccessibility. To elaborate on Z.Schroeder’s remark about Henders Island, a very complete plot outline is given on Wikipedia. The island is populated by viscous fast monsters that have remained isolated because they cannot tolerate salt water. The island is remote, in the South Pacific, “about 1,400 miles south-southeast of Pitcairn Island.” It’s at a latitude where ships don’t like to travel, so the shipping lanes miss it. The 1791 voyage that did stop there found a butte sticking out of the water with no landing, as Robert Columbia notes in his answer. This includes lack of a reachable anchorage for the ship anywhere around the island. Note that in this story, only one crewman was killed. The monsters only attacked the shore party, and the ship, several hundred yards off, was safe. The captain chose not to report the attack but indicate that it’s not worth visiting. So, it is approachable, but nobody bothered going there. An ocean vessel could keep station without anchoring and send a launch. They could bring ropes, ladders, etc. to get up onto the land (but then be killed). But even without monsters, his explaination as to why nobody did go there (even though they could) does seems to hold up through the age of sail. Strong gale winds and repeated cyclones regularly occur in a ring-like arrangement around the island causing attempts by explorers to prove fatal, discouraging others from trying. Floating sea weed surrounding the island releases [enter some hormonal drug-ish something], causing sailors to be very aggressive. This leads to massacres aboard the ship, while the lone massacre-er starves to death as the weed entangles the ship's rudder. Jagged rocky structures surround the island, both above and below water, severely damaging ships, while row-boats are not enough for the rest of the journey. Your imagination limits you in these setups. A lighthouse was constructed in 1909 to steer ships away from the island, operated by a single family. The family was found dead in the 1920s, having died from attacks by golden lanceheads that had entered the residence. The lighthouse is now automated. Due to the number of snakes and toxicity of their venom, the Brazilian Navy took action and closed the island to the public. There is a difference between unreachable and uninhabitable. 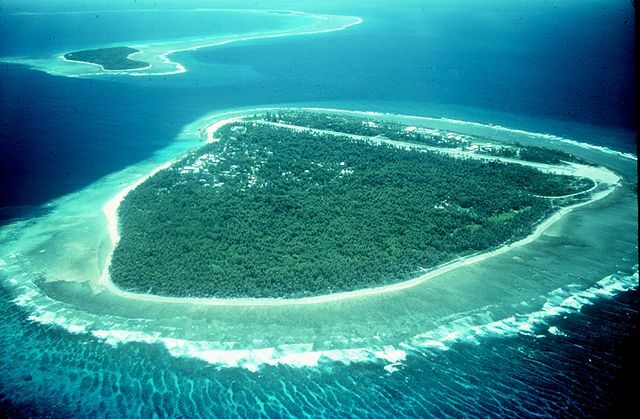 Johnson/Nikamuoro Island, where Amelia Earhart probably met her end, is reachable, but in a tropical climate with no fresh water, it is uninhabitable for any length of time. Bikini Atoll is reachable, but is still too radioactive to remain for long. Rockall Island is reachable, but there is no practical reason to want to land there, aside from the difficulty in actually getting ashore. For an island to be unreachable, with 17th century sailing methods, and for that island to be located in the subtropics, which counts out extreme cold in the polar regions preventing it from being reached with 17th century technology, it would have to be a combination of the island itself being uncharted and thus unknown (a lot of the oceans were uncharted in the 17th century), and protected with either doldrums (no wind) or prevailing winds not being favorable for discovering the island. 1) Difficult to navigate to even within a few hundred kilometers of the island; compasses don't work, cloud cover for most of the year so astrogation doesn't work. 2) No need to go that far south to begin with as there's no indication there's resources there worth exploring. 3) Large/powerful ships are needed to get within range of the land. 4) The ice extends too far from the land mass to make a ground-trek to the island possible. Just to build on some of the excellent suggestions here already (particularly the reference to the Sargasso Sea) ... I think one could really push one's creative license to describe an island that is formed from the volcanic pumice ejected from a globally-sized geo-kinetic cataclysm (see Deccan Traps). The volcanic pumice is buoyant and naturally floats (silicon dioxide mostly)... and given a mid-ocean gyre such as the previously mentioned Sargasso Sea, one could have an island that is rotationally bound and agglomerates much in the same way that planets form from proto-planetary disks, or similarly the ocean garbage patches currently found in several oceanic locations of our own world. Sufficient geologic time and a few thousand fertilizing seabirds could instantiate a biome on this floating mass of pumice. The ocean gyre adds climate-change possibilities on human time-scales as the surface current and trade-winds slowly but surely rotate the pumice-island from the sub-tropics to the sub-arctic and back again on regular and predictable cycles. For a 17th century mariner, this moving target would be the equivalent of Terra Incognita, a rum-induced mirage, or similar, yet it can be habitable and perpetual… and intriguingly predictable. The island is surrounded by sharp rocks, the area is shallow, and/or strong currents smash the ships into the rocks. The island is encircled by a lava, wood ships touches it, starts a fire. The burning ship has to retreat or everyone is killed by the lava or ship fire. Even if there was a natural underground thermal vent and water temps were 140F, the crew would be in a wooden oven(ship). Leave or bake to death, even 120F might be problematic. The island is surrounded by a waterfall - the sea water goes to the abyss. The island is surrounded by extremely turbulent water, with whirls. The island is surrounded by extremely hot, boiling water. Extremely dangerous animals occupy the waters around the island, for instance those who prey on ships and their crews. The island is surrounded by artificial anti-ship traps and hedgehogs installed in the ancient times. Its just really far away from anywhere worthwhile going. The Easter Island was discovered by a European in 1722 after someone spotted it by accident in 1687. So, had it been somewhat smaller (as is your island) and also typically rainy there (lots of clouds), no one will have plausibly have found it. 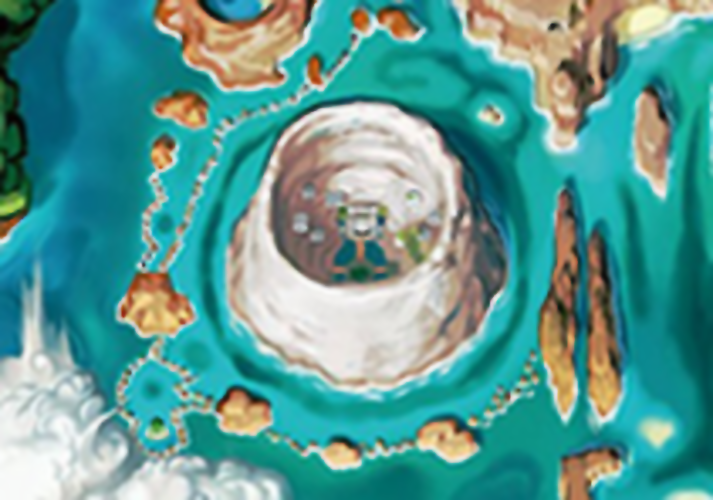 The idea isn't fully fleshed out, but... imagine an island with ring mountains with unscaleable cliffs. There is a sea current that runs around this tear drop shaped island. It has a saltwater river exiting on the leeward side of the island. This river is fed by an underwater intake that funnels water from the current, like a ramjet. Leaving the island would be easy. Fishing with nets in the flow provides for the inhabitants. The cliffs would have the added issue of extreme smoothing and polishing by sand blasting provided by the current. There would be no anchor point for a ship and smaller crafts would be pushed along by a current that got stronger as you approached the island due to a venturi effect. Not the answer you're looking for? Browse other questions tagged science-based climate geography or ask your own question. What is a realistic plague that could have wiped out the population of an island? What sort of geological features or weather patterns would create a region with the same temperature year-round? Is there any plausible way that my fictional island could be inhabited by animals from African and Indonesian origins?